If you’ve been taking steps to improve your health through better eating, you’re on course to make a major positive impact on your life. Too many Americans fail to pay attention to this, and end up suffering as a result. Many of us know about the benefits of eating more fresh fruits and vegetables, but did you know that so-called “super foods” can make even more of a difference in your wellbeing? Super foods are overflowing with health benefits, and many of them probably aren’t on your current menu. To take your health awareness to the next level, check out these six super foods to include in your diet. Mushrooms are awesome. They contain seven different vitamins and minerals, they improve your immune system, and they’re very satiating, which can be a great help when it comes to weight loss. Chop them up and sprinkle them on a salad or eat them with some healthy dips. If you don’t like them raw, try slicing and sautéing them in extra virgin olive oil with some garlic, salt, and pepper. Or, marinate them in garlic butter and red wine, then boil them whole and dig in. If you historically haven’t liked mushrooms, try giving them another shot – your taste buds can change over time and what you’ve disliked in the past may be palatable now. Avocados are heavy in fat, but it’s the good type of fat. That means your body benefits through improved digestion and a lower risk of heart disease. Cut them up and eat them on top of a salad or even on a cracker with a slice of tomato – or go the extra mile and make some fresh guacamole. Dice up four avocados, add a half-cup of milk, and blend it all up in a food processor. Then add some lemon juice and salt, and you’ve got a tasty dipping snack or, if you want to get super-creative, a topping for fish, meat, or chicken dishes. Try making your next tossed salad with spinach instead of lettuce. Just top it with some olive oil, lemon juice, salt, and pepper. Not a salad fan? Sauté it in the same oil and add some salt, pepper, and fresh garlic. Spinach is a super food because it contains calcium, magnesium, potassium, and Vitamin A. It can help you with blood pressure management, digestive issues, and bone health. Salmon is a super food, but it’s also super-cheap – at least compared to other seafood options. Choose wild-caught salmon over farm-raised as it’s higher in calcium, iron, potassium, and zinc. It’s heart-healthy, and can reduce your risk of cancer, as well. Grilled salmon is out of this world, but you can also pan-sear it or bake it with a little lemon juice. Brown rice is a much better option than white rice – it’s unrefined and contains natural versions of protein and nutrients. Even though it takes longer to cook, you definitely benefit in the long-run. The next time you’re putting together a chicken dish, a soup, or even a side dish, consider using brown rice. It can reduce your chances of diabetes and help lower your cholesterol. Both flaxseed and hemp seed benefit you in different ways. Flaxseed can reduce the possibility of developing cancer, diabetes, and heart disease. Hemp seed aids your body in burning fat and lowering cholesterol. You can sprinkle either on a salad, or include them in a soup, casserole, or just about anything you can think of. Hemp seed even adds a nutty taste to any recipe you include it in. Now that we’ve talked about some of the super foods you should include in your diet, let’s discuss ways to save money on them. For any produce items, try to find a farmers market or farm near you. They feature fruits and veggies, often at much cheaper prices than elsewhere. You could also sign up for the loyalty program at your preferred grocer. Typically, these programs track your purchases and send you targeted coupons in the mail. Eating a diet filled with super foods is great for your health, just don’t let your checking account take a beating in the process. 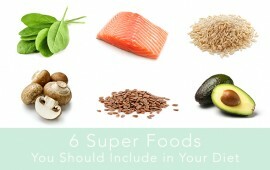 Do you know of any other super foods? Share in a comment below! Lonnie Brown writes about health and wellness and shares tips to stay healthy and look great on a budget.